Tuesdays and Thursdays are STUDENT days. Contact reception for details or refer to current promotions over School Holidays. Hair Outaquin have joined Sustainable Salons Australia where 95% of everything we use will be recycled along with helping a range of charities. This means a $2 Green fee will apply to every salon visit. (prices may vary due to length, thickness and individual requirements) Olaplex is available on all services as well as a stand alone service. 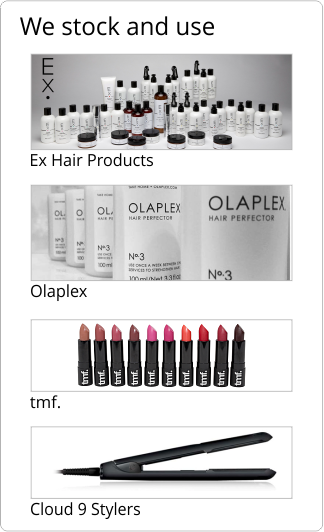 Refer Olaplex price schedule. Bleach applications and Colour Splash colours are extra depending on requirements. Colour corrections will only be booked after a physical consultation. All colour corrections first visit require Olaplex and finish/blowdry. No exceptions. (Foils start from $104 unless with std colour) Olaplex is available for all services as well as stand alone service. Refer Olaplex price schedule. Foil + colour package prices available. When receiving a foil / meche service with a standard colour (block colour in between) the foil price is reduced as a package. If going from dark to blonde. Do not book foils only. That is a colour correction service. Please note relax or body appointments can only be taken with a haircut or finish appointment. Above pricing is re texture portion only (Extra product may be required based on thickness and individual requirements). Xtenso Moisture pricing includes finish as part of process. Xtenso Moist pricing is starting price only. Salon needs to see hair prior (no charge) and 50% deposit is required to book an Xtenso Moist service in person first time. Please note we are unable to take an appointment for this service until we have seen your hair. This can be via email - two pics one from side one from back showing hair full length and down, please contact reception for further details. Should you wish to proceed a 50% deposit is required to reserve a Keratin smoothing treatment service. Please note the above prices are starting prices only, cost will increase based on length and thickness of hair not how curly or frizzy. Due to the nature of the service and time required we are only able to reserve appointment times for this service once we have received the deposit. Which we cannot do without seeing the hair. Quality of the results comes first. We are happy to forgo an appointment rather than run the risk of a poor outcome via lack of planning or time. Please note Olaplex/PCC only package is an add so can only be used with another service.